Can electric power take the sweat out of pedal power to make it one clean, cool and practical combo? Bicycles have had a fairly varied history. They've been around for almost two hundred years now, and have evolved significantly during that time. The first bicycle ever built, known as the Laufmaschine (German for "running machine") in 1817 was completely different from those of today, and wasn't nearly as comfortable either. Since then, bicycles have come a long way - dial in multiple gears, a lighter frame and suspension and it's a whole different ball game. And, that's where we thought the evolution of bicycles would end, and boy were we wrong! Electrification, which has been seen on cars and bikes, is now transitioning to cycles too. We’ve already seen a couple of variations in the market, but we recently managed to get our hands on Hero’s latest offering, the EZephyr which is an electric cycle, and here’s our take on the two-wheeled future. So how does it function? Essentially, the EZephyr is an electric hybrid bicycle, meaning, it has the characteristics of both, a mountain bike and a road bike along with the assistance of an electric motor and battery. The one we have, however, is inclined more towards the road, and its skinner tyres and absence of the front suspension should give you an idea. The bike gets a seven-speed Shimano drivetrain system with a pretty nifty gear shifter. The shifter is designed in such a way that both the up and down shifts are integrated into one single unit which is placed atop the right side of the handlebar. Use the lever with your index finger for downshifts, or thumb the ‘SIS Index’ button on the shifter to shift up. Additionally, the bright orange gear indicator needle is quite visible, be it day, night or heavy downpours. However, the tiny glass shield on the indicator does seem to fog up in the rain. So how exactly does the electric assist work? A Panasonic Li-ion battery (36V, 5.8Ah) sits in the lower beam of the frame, perfectly hidden from sight, so much so that the EZephyr can easily pass for a normal cycle instead of an electric one. And that’s connected to a pretty powerful BLDC 36V, 250 Watt hub motor at the rear axle which puts out a whopping 40Nm of torque. That’s more than most sub-400cc bikes out there. Now, this is where things get really interesting. Much like today's teched-out motorcycles, the EZephyr also gets four power modes. Yeah, you heard that right, power modes! These power modes can be selected through a small module, the size of a pager, placed on the left side of the handlebar. The module has an on/off button, a four-stage battery charge indicator (low to high), power modes and a walk assistance mode. That said, if you use the boost from the electric motor when pedalling you can hit much higher speeds of upto 45kmph. In a nutshell, the 'Assist' feature almost feels like a performance enhancement drug for the cycle. The modes basically control how much assistance the electric motor provides while pedalling. So every time you apply force on the pedals (i.e. start pedalling or attempt to increase your speed), the motor automatically gives you a boost of power which makes cycling much easier. The power delivery may only last for around 2 seconds in ‘Low mode’, but it's delivered in such a way that even the 7th gear feels like 1st. Toggle into ‘Medium mode’ and the boost is delivered for a longer duration while pedalling. In ‘High mode’, the electric motor constantly intervenes while pedaling. It feels almost like you’re riding an electric scooter as only minimal pedal inputs are required. The fourth mode, known as the ‘Walk Assistance mode’, lets you crawl at 6kmph as long as the button is pressed. This feature may prove useful while talking to your peers who are on foot and riding casually alongside them or even while pushing the cycle in case of a flat tyre. And then, if you use the throttle, you can use the electric assist at your command, and quite literally ride around like an electric scooter at 25kmph (company claimed). On one of the testing days, I rode the cycle for a little over 32km with breaks obviously, but without breaking a sweat. So how long does the battery last? The EZephyr uses a lithium ion battery, hence the miniature size. According to Hero Cycles, the bicycle can travel a distance of 45km (company claimed) using purely electric power, however, if you were to use the pedal assist feature you’re sure to go for a little more than 45km. That’s more than enough juice for your daily commutes. For instance, we travelled for approximately 28km with the assist feature and still had a little over 25 per cent left on the battery. As for charge times, It took us between four and a half to five hours for a full charge. Also, on the upside, the battery is replaceable. This should come in handy when its charge holding capacity drops over time (a couple of years we reckon). The downside to the cycle is you would most likely need to take it inside your house to charge the battery, unless of course, you have a plug point available in the parking lot. On the upside, the power brick looks like a conventional laptop charger which can easily fit in your backpack. The EZephyr comes with a seven-speed Shimano gearbox, which is useful if you plan to just pedal. It uses a 6061 aluminium alloy frame which misses out on suspension, both at the front and back, so, do expect a relatively stiff ride. Is the cycle heavy then? Not really, even with the battery pack and electric motor, Hero has managed to restrict the weight to just 16kg. To put things into perspective, the EZephyr weighs just around 4kg more than an average hybrid cycle around the same price range. The bike gets a front disc brake and a conventional V-brake at the rear. Both the brakes lack bite and leave much to be desired in terms of braking force, with the rear one being especially weak. To top it off, the rear V-brake had uneven wear on the brake shoes. Moving to the rims, the cycle uses 700C, double wall, 36H rims which are wrapped in skinny road tyres. The tyres are grippy enough for everyday road riding, be it wet or dry, while the larger-diameter rim improves handling and high-speed performance. The tyres use Schrader valves which are most commonly used in cars and bikes, so you can inflate directly using a standard pump. The front wheel has a quick release lever while the rear wheel only comes off using tools. Additionally, Hero provides a few accessories such as an LED light up front, side stand and reflectors (Front & Rear) that come as standard with the EZephyr, which usually costs extra otherwise. Additionally, the firm will also provide a 12-piece toolkit along with the cycle with a special key to remove the battery if required. The front light draws power from the Li-ion battery itself and is easily detachable if need be. Mounting points for any other kind of accessory are available as well. The EZephyr looks like any other hybrid bicycle which is a big plus considering its an electric cycle housing a hub motor and battery. It comes in two liveries, namely red and blue, although we preferred the more eye-catching Ferrari red paint job. The paint quality is top-notch too. The slightly wide and narrow seat is well cushioned right off the shelf and you won't face much of a problem for everyday commutes. The height of the seat can be adjusted effortlessly using the quick release lever. The cycle we had for tests already had a lot of play in the left brake lever that made it feel flimsy. However, in terms of comfort, the levers are good enough for average-sized hands. Take a closer look at the cycle and there are a few issues here and there. To shed some light, on occasions, there is a small spark when you connect the charger to the cycle even if the power cable isn’t connected to the socket. Another issue is that you can never tell the exact amount of charge left on the cycle, as the indicator on the module only displays information in four bars (low to high) which isn’t completely accurate. Last but not the least, the paint colour on the rear rim wall tends to wear off as it constantly rubs against the brake shoes. All things considered, the touch, feel and overall build quality of the cycle is excellent apart from the aforementioned niggles. Furthermore, at this price point, the EZephyr doesn’t have any competition apart from the much more expensive Being Human cycles and Tronx cycles (Rs 40,000 to 50,000). 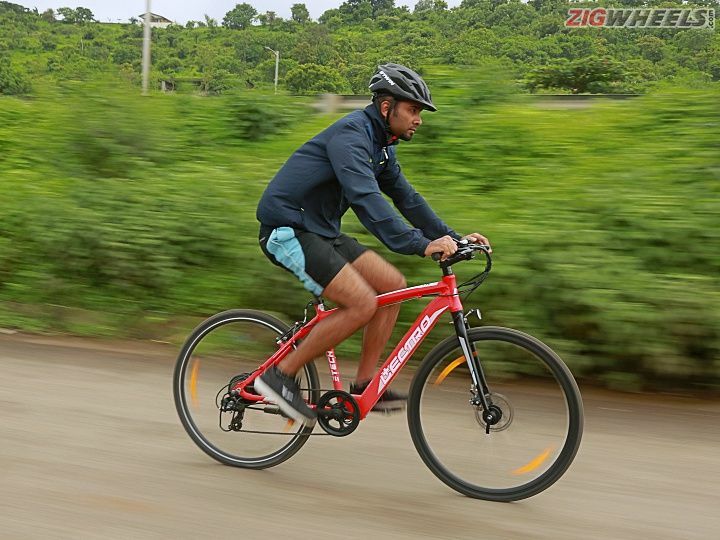 To compete with these bikes, Hero also has alternatives, called the Ozone 26T and Ozone 650B which are priced at Rs 44,900 and Rs 45,490 respectively. These cycles do offer better range and boast better equipment compared to the EZephyr. But this is the EZephyr’s strong point. There’s no other electric bicycle at its price point, and that, almost by default, makes it great value for money. It’s something that could easily handle commuting duties through tightly packed city streets at the speeds of conventional scooters, and at the same time, provide enough assist to not get you all sweaty on your way to work. Overall, it’s is a well packaged electric cycle, and I’m definitely considering getting one for myself once it's launched. What about you?